Yesterday, it was reported that the Financial Stability Board will investigate the leveraged loan market. Such a review is welcome and overdue. Our hope is that it will include an objective and self-critical look at the history of regulation in this area. To wit: in one form or another, the U.S. banking agencies have been warning banks of impending losses in leveraged lending for twenty years, and over the last five years they heightened their rhetoric and took increasingly aggressive efforts to force banks to restrict lending to growing businesses that meet the agencies’ definition of leveraged. As such, this effort has been the most continuing and serious U.S. foray into what global regulators have begun calling “macroprudential” regulation. It also has been a demonstrated failure and a cautionary tale for future such efforts. It does not augur well for the ability of global regulators to manage future financial crises and argues for great caution and much study before they attempt to replicate such an effort. As described by its adherents, “macroprudential” supervision differs from microprudential regulation in that it focuses on the broader financial system, including interactions between financial institutions, markets and the overall economy. Former Fed Governor Daniel Tarullo referred to macroprudential supervision as “a regulatory regime that focuses on the financial system as a whole, and not just the well-being of individual firms.” The Basel Committee has described the purpose of macroprudential supervision as “[reducing] systemic risk, strengthening the financial system against shocks and helping it to continue functioning stably without emergency support on the scale that was extended in the crisis,” and noted, “Macroprudential policy focuses on the interactions between financial institutions, markets, infrastructure and the wider economy. It complements the microprudential focus on the risk position of individual institutions, which largely takes the rest of the financial system and the economy as given.” Thus, macroprudential supervision is profoundly more ambitious than microprudential regulation and examination in every respect: its scope, its potential effects and (presumably) the data and analysis necessary to support a decision to impose it. Certainly, some regulators have noted the limitations of “macroprudential” supervision. The Basel Committee noted that it is not an exact science and that “our understanding of how the financial system behaves and interacts with the macroeconomy remains very incomplete. The same is true for the potential role of macroprudential policy in influencing that behaviour and interaction.” Janet Yellen has also referred to macroprudential supervision as a “work in progress”. Leveraged lending presents an excellent case for studying how that work is progressing. Beginning in 2013, the Federal Reserve, OCC and FDIC explicitly identified leveraged lending as a macroprudential threat. They issued guidance that described their concern that “a poorly underwritten leveraged loan that is pooled with other loans or is participated with other institutions may generate risks for the financial system.” Chair Yellen, while discussing increased risk-taking across the financial system that could necessitate a “more robust macroprudential approach,” referred to the significant easing of terms and conditions in the leveraged-loan market. Regardless of the presence or absence of analysis at the time, five years hence, the agencies diagnosis has clearly been proven wrong. While the data on leveraged loan defaults is thin, there appears to be no indication that leveraged loans have experienced abnormal default rates since the agencies issued their guidance. According to the Loan Syndications and Trading Association, the default rate on leveraged loans as of year-end 2018 was 1.6 percent – low by historical standards — and expected by Fitch to decline to 1.5 percent in 2019. In short, we are aware of no data — and the banking agencies have produced none — to suggest that the types of leveraged loans about which they expressed “macroprudential” concern in 2014 have in fact underperformed. Of course, the agencies might contend that while the forecasted losses have not occurred to date, they will at some point. But this is the last refuge of every market timer. Those who constantly predict a bear market will at some point be proven right, but they will live a life of poverty if they follow their own investing advice. Alternatively, the agencies could contend that the reason that there have not been large losses in leveraged lending is because their guidance and subsequent examination actions have been so effective. Of course, under this logic, all “macroprudential” efforts will be considered a success: if the risk materializes, then by definition the regulators were correct in warning against it; if the risk does not materialize, the regulators were not only correct in their warning but extremely effective in their supervision. But in the case of leveraged lending, we know that their warning was ineffective because the result of their examination pressure largely was to push those loans outside of the banks they regulate to other holders (as detailed below), where those loans apparently have performed well. And that brings us to a second major problem with “macroprudential” supervision. As described by its disciples, the focus of macroprudential supervision is on the entire financial system and global risks to financial stability. In the case of leveraged lending, however, the guidance and subsequent FAQs were enforced against only banks and bank holding companies regulated by the Fed, the FDIC and the OCC. Moreover, the guidance and FAQs were not addressed to, or enforced against, any actor in the financial system that was not regulated by the three primary bank regulatory agencies. The guidance and FAQs mandated how banks were to lend to leveraged borrowers in a “safe-and-sound” way. The guidance relied on institutions to define leveraged lending, but included common definitions such as 4.0X for total debt/EBITDA and 3.0X for senior debt/EBITDA, and noted that a leverage level exceeding six times total debt divided by EBITDA “raises concerns for most industries.” The FAQs further complicated the standards by determining that financial institutions could no longer exclude loans from being considered leveraged lending “solely because they do not meet a purpose test” and by mandating that banks calculate leverage multiples based on committed debt, including any undrawn additional debt that the loan agreement may permit. As a result, there was a substantial increase in high quality, investment grade borrowers that now fell under the rubric of leveraged lending for regulated entities. Nowhere in the agencies’ leveraged lending guidance, including in the proposal, is there any reference to or examination of the guidance’s potential costs. The only costs that appear to have been considered by the U.S. regulators are the economic impact on small banks, defined as those with total assets of $175 million or less. Even here, the agencies simply note that given that most leveraged loans are held by institutions above that threshold. Ironically, as the research shows, the fact that the guidance and FAQs were so ineffective in reducing total lending indicates that its costs may have been muted. On the other hand, because banks tend to be the low-cost providers of credit, it seems likely that growing businesses have seen their funding costs increase unnecessarily as a result of the agencies’ regime. Of course, what is most remarkable is that over a five-year period, neither the agencies themselves nor staff researchers appear to have made any attempt to quantify this cost, let alone consider it. That brings us to another problem with the agencies’ campaign against leveraged lending by banks. Although the agencies labeled the leveraged lending rules as “guidance”, the reality is that this guidance was enforced as though it was a binding regulation through “relentless pressure” from regulators and a “no exceptions” approach to the guidance. The Congressional Review Act requires that before any rule can become effective, it must first be submitted to Congress and the GAO for review and potential disapproval. The GAO examined the leveraged lending guidance in 2017 and agreed that notwithstanding its label from the agencies, it is in fact a “rule” under the Congressional Review Act and therefore subject to the review requirements. While the GAO was not asked to rule on the subject, it also would appear that, as enforced, the FAQs constituted the type of rulemaking for which public notice and comment was required under the Administrative Procedure Act, but never sought. Thus, the agencies here operated in a “macroprudential” vacuum. As demonstrated by the 2017 NY FRB study, the largest impact of the leveraged lending guidance was seen following the issuance of the 2014 FAQs. Prior to the FAQs, the study found that “banks did not respond to the interagency guidance when it was first issued in 2013.” After the FAQs were issued, LISCC banks significantly lowered their leveraged lending while nonbank lenders continued to increase their leveraged lending. Similarly a 2016 paper from economists at the Federal Reserve Board and the Federal Reserve Bank of Philadelphia studied the impact of the leverage lending guidance and the FAQs at reducing banks speculative term-loan originations. The paper found that the guidance itself did not have a significant impact, but that following issuance of the FAQs there is “strong and consistent evidence that banks decreased their speculative-grade term-loan origination share.. However, the paper found no statistically significant change in the behavior of nonbanks in the SNC data following issuance of the FAQs. This is particularly significant because the 2014 FAQs, unlike the 2013 guidance, were never released for notice and comment, which would have afforded banks and other interested parties an opportunity to point out the shortcomings with the clarifications included therein. “Macroprudential” means never having to say you’re sorry. Just last month, the regulators were again warning against the risks of leveraged lending, stating that the Shared National Credit review “finds increased risks associated with leverage lending.” However, the SNC report relied upon by the regulators provides no statistical evidence that risks associated with leveraged lending had increased, and particularly increased at banks. BPI’s analysis shows that the share of leveraged loans rated below pass actually decreased to 11% in 2018 — down from 15% in 2017. The percentage of loans rated non-pass is the precise measure the agencies used to conclude that the “risk in the portfolio of large syndicated loans has declined.” In light of these facts, it seems curious that the regulators concluded that the risk of leveraged loans had gone up without citing any addition evidence. 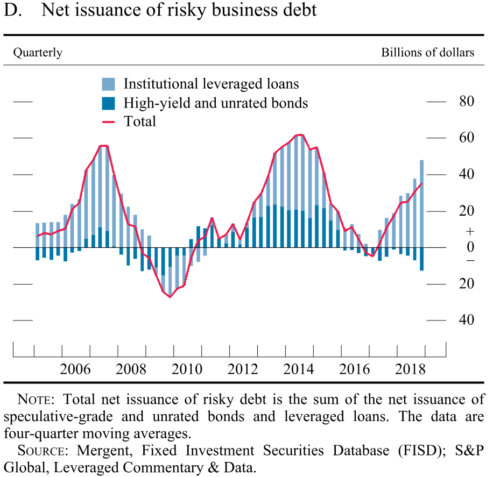 In fact, the SNC report indicates that “[m]ore leveraged lending risk is being transferred to … nonbank entities”, demonstrating that banks do not hold a greater share of leveraged loans or increased exposure to the associated risks. Further, the agencies provided no evidence that banks hold the “riskiest” leveraged loans, and we encouraged them to publicize additional information to allow the issue to be explored further. The share of newly issued large loans to corporations with high leverage — defined as those with ratios of debt to EBITDA (earnings before interest, taxes, depreciation, and amortization) above 6 — increased through 2018 to levels exceeding previous peaks observed in 2007 and 2014, when underwriting quality was notably poor. In addition, issuance of covenant-lite loans — loans with few or no traditional maintenance covenants — remained high during the second half of 2018, although this elevated level may reflect, in part, a greater prevalence of investors who do not traditionally monitor and exercise loan covenants. Relatedly, growth in syndicated lending picked up strongly at the end of last year, although it has reportedly slowed in recent weeks. The question is what role the government should play in this dynamic market. For a five-year period, that role consisted of warning of an impending crash, reducing the role of banks in it through ultra vires examination pressure, and watching the risk migrate to non-banks. It is difficult to see that effort as anything but a failure. Certainly, at some point, there will be large losses to leveraged lenders when the growing companies who carry the credit suffer economic misfortune. The same could be said of any asset class. For that reason, banks are required to hold capital against all their credit (and market and operational) risks — all the time. Those capital requirements include stress testing against a financial crisis worse than the 2007-2009 global financial crisis. “Macroprudential” supervision is different because it presumes that the agencies can time the market and identify an asset class about to experience a drop in value; restrict bank exposure (and only bank exposure) to it; and thereby limit overall financial stability risk. If the premise is wrong – if the agencies cannot market time, or cannot constrain financial stability risk by focusing only on regulated banks– the result generally will be less credit for the economy at all times, with little financial stability benefit. Or, as we have seen in the case of leveraged lending, shifting credit provision to unregulated entities and thereby potentially increasing overall risk in the financial system. Here seems to be an area where Congressional oversight would appear warranted. So, too, would further research by the academic community, whether economists within the banking agencies or without. We hope the FSB commences its effort with eyes wide open. See OCC Advisory Letter AL 99-4 (May 1999) and FRB Supervisory Letters, SR 99-23 (1999), SR 98-18 (1998). CGFS Papers No 38: Macroprudential instruments and frameworks: a stocktaking of issues and experiences. Interagency Guidance on Leveraged Lending (March 21, 2013). Remarks by Janet Yellen on Monetary Policy and Financial Stability (July 2, 2104). Speech by Daniel K Tarullo on Monetary policy and financial stability (February 24, 2014). Conversely, in the event that no financial stability arises as a result of the agencies’ actions, there may be little evidence to demonstrate that their efforts were successful. As described in the following section, this effort was in violation of law. Kim, Sooji and Plosser, Matthew C. and Santos, João A. C., Macroprudential Policy and the Revolving Door of Risk: Lessons from Leveraged Lending Guidance (2017-05-01). FRB of NY Staff Report No. 815 at 23-24. In other contexts, as a theoretical matter, the Federal Reserve has acknowledged that macroprudential supervision involves costs. In 2010, Janet Yellen stated unequivocally that “macroprudential policies will entail some costs as well as benefits.” Remarks by Janet Yellen on Macroprudential Supervision and Monetary Policy in the Post-crisis World (October 11, 2010). Similarly, the ECBs 2017 guidance on leveraged transactions contains no consideration of costs. See Tracey, R. (2015). Feds Win Fight Over Risky-Looking Loans. Wall Street Journal. Available at: https://www.wsj.com/articles/feds-win-fight-over-risky-looking-loans-1449110383; see also Roumeliotis, G. (2014). U.S. Fed warns of more bank scrutiny over leveraged loans. Reuters. Available at: https://www.reuters.com/article/us-fed-leveragedloans/u-s-fed-warns-of-more-bank-scrutiny-over-leveraged-loans-idUSBREA4C11D20140513. Calem, Paul, Ricardo Correa and Seung Jung Lee (2016). Prudential policies and their impact on credit in the United States. International Finance Discussion Papers 1186.